After coming a close second on the outbound leg, so Yves le Blevec's Actual won the return leg of the Vendee St Petersburg race for the Multi50s. 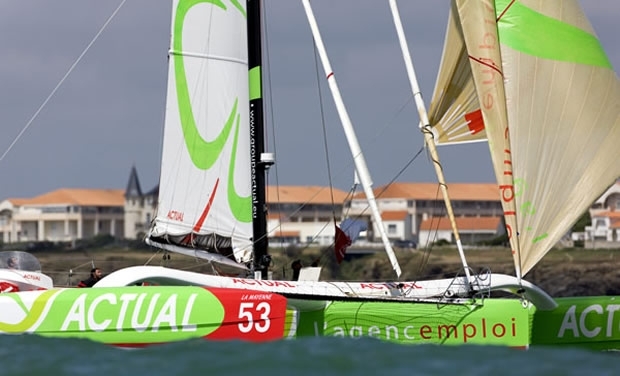 After a fast passage down the Atlantic coast of France at more than twenty knots under gennaker with one reef in the mainsail, Actual crossed the finish line at St Gilles Croix de Vie at 13 hrs 29 mins 25 secs GMT, after a racing time of 5 days 21 hours 10 minutes and 25 seconds from St Petersburg. Actual’s win has its origins back in the North Sea, before they made their way through the Dover Straits, as le Blevec and his crew made gains thanks to a small tactical option going further west than their arch rival, Franck Yves Escoffier’s Crêpes Whaou ! 3. As they entered the English Channel, the two leaders were 25 miles apart, and hoping to close the gap, Franck-Yves Escoffier chose to hug the coast of Brittany, while Actual went in search of the forecast northwesterly new breeze. The result of their respective strategies was that Escoffier's red trimaran was some 50 miles behind by daybreak. Maintaining his sense of fair play, the skipper of Crêpes Whaou ! 3 admitted that he had made was a do or die decision, knowing that it could worsen his situation. The win offered Le Blévec revenge in two ways: for the first leg, when they lost out by some 75 seconds to Crepes Whaou! 3, but above all for when Actual to retire shortly after the start of the last Transat Jacques Vabre following a capsize. Immediately, upon her arrival friends and family went on board Actual, accompanied by Eric Loizeau, who raced with them in the first leg. For this leg le Blevec was sailed three up with Ronan Deshayes, his shore crew and Incidences sailmaker Jean-Baptiste Le Vaillant. "It’s difficult to describe," said le Blevec. "Obviously we’re very pleased. It was a really exciting race. On the outward leg as well as on the return leg. We overtook, got overtaken and overtook again. I’m just so pleased to be the first back to Saint Gilles. It was all really down to some small tactical choices. In the North Sea, we gained a slight advantage. We decided to continue with our option in the English Channel and it certainly paid off. Crêpes Whaou ! 3, Escoffier (skipper) also sailing with two crewmen, Kevin Escoffier and Antoine Koch, crossed the finishing line at 17:13:27 GMT with a race time for the second leg of 6 days 54 minutes and 27 seconds.